Click here for audio of Episode 426. Today, we meet a wounded genius. The University of Houston's College of Engineering presents this series about the machines that make our civilization run, and the people whose ingenuity created them. Oliver Heaviside was born in the same London slums as Dickens was. Scarlet fever left him partly deaf. He compensated with shyness and sarcasm. 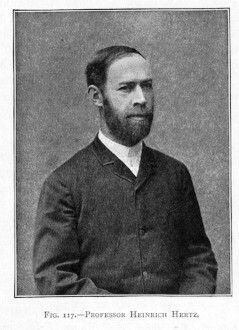 Heaviside finished his only schooling in 1865. He was 16 and a top student, but he'd failed geometry. He loathed all that business of deducing one fact from another. He meant to invent knowledge -- not to compute it. Heaviside went to work as a telegrapher. That drew him into the study of electricity. Then he read Maxwell's new Treatise on Electricity and Magnetism, and it seemed to have mystical beauty. It changed his life. He quit work and sealed himself in a room in his family's house. There he reduced Maxwell's whole field theory into two equations. He gave electric theory its modern shape and form. Hertz got the credit for that. But in the fine print Hertz admits his ideas came from Heaviside. Next Heaviside picked up the radical new idea of vector analysis. His most important ally was the reclusive American genius J. Willard Gibbs. Vector analysis won out, but only after Heaviside -- this shy man with his acid pen -- had started a war. He brought that war to full pitch a few years later with something called operational calculus. He invented this strange new math by leaping over logic. It was a powerful tool, but it wasn't rigorous. Only people like Kelvin, Rayleigh, and Hertz saw the brilliance that was driving Heaviside faster than method could follow. He knew what he was doing. He growled at his detractors, "Shall I refuse my dinner because I do not fully understand ... digestion?" Like vector analysis, Heaviside's calculus stood the test of time. So did the rest of his work. He gave us the theory for long distance telephones. His math has served and shaped engineering. Yet his biographer, Paul Nahin, writes a sad ending. Heaviside grew sick of fighting and faded off to Torquay in Southwest England. There he lived out his last 25 years in a bitter retreat. He signed the initials W.O.R.M. after his name. That didn't stand for anything more than worm. For that was all he could see when he looked into other people's eyes. You don't see much of Heaviside's name today. But his magnificent works have been woven into the fabric of our textbooks. He deserved a better end. Yet his huge accomplishments force a happy ending on a sad life. They also warn us to be alert -- to be ready to see raw genius like that when it walks among us. Nahin, P.J., Oliver Heaviside. Scientific American , June 1990, pp. 122-129. Nahin, P.J., Sage in Solitude . New York: IEEE Press, 1988. 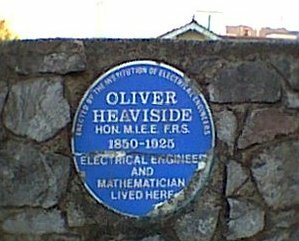 Memorial to Oliver Heaviside placed at his home by the British Institution of Electrical Engineers. My thanks to Kathleen Butler for obtaining and providing this photo.